On episode 88 of the Hart & Usagi Podcast we chat about a variety of topics like Dotemu bringing back two classics, Yakuza series turned down by video gaming hardware companies, and more. Episode 83 of the Hart & Usagi Podcast is here! We chat about a variety of topics like new fighting game guest characters, Sony to publish Switch games, loot boxes, and more. In this new episode of the Hart & Usagi Podcast we talk about PlayStation 2 emulation on PlayStation 4, the ghastly phrase “Blast Processing”, YouTube’s Fair Use protections, and a Black Friday rant among other topics. The average score for the Wii U exclusive game Devil’s Third is a 3.8 out of 10 according to GameRanking.com. This attitude of reviewers don’t know how to review is the same sentiment from the developers of the PS3 title, Lair. Back then Factor 5 went as far as sending out a “review guide” on how to properly review their game. Itagaki is a shallow man who thinks he’s owed something just because a few games he made while at Tecmo were well received. I’m sure those who reviewed Devil’s Third did give it the proper evaluation it deserved. I mean, the design of the main character, Ivan, alone looks horrible. He looks like a bad rendition of Hakushi (Jinsei Shinzaki). On this episode of the Hart & Usagi Podcast we chat mainly about the game announcements from E3 2015 among a few other things. Join us. * USgamer Community Question: What’s Your All-Time Favorite Arcade Game? * How Far Can Drawn to Death’s Intriguing Aesthetic Take It? We return with a new episode of the Hart & Usagi Podcast and are joined by ebbderelict discussing a possible Tetris movie, Vib Ribbon’s North American release, and Turtlevania. Then I regulate on GameStop, CBS commentators, and Polygon. All this and more so tune in now! 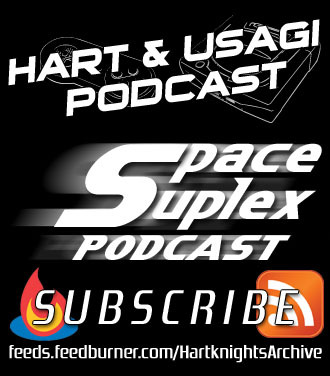 Despite the heat HartKnight and Usagi704 are back with episode 47 of the Hart and Usagi Podcast! Do we have a show for you? Absolutely. We welcome ebbderelict back for a fourth time and talk about Tetris being the greatest game ever and how maybe Super Mario Bros. isn’t. There’s also more sad excuses for microtransactions and an unlikely opponent of the FCC. Enjoy the show and remember to subscribe and follow the Hart and Usagi Podcast today!